Fresh sweet corn is a treat, and corn from your own garden doesn't get any fresher. Corn is a challenging crop to grow for home gardeners. It requires a long season, lots of sun, rich soil and lots of room. Unlike other vegetables like tomatoes, peppers or squash, growing only three or four corn plants isn't feasible. If you meet the basic requirements of growing corn, you'll be rewarded with a bountiful harvest. Corn is a warm season crop. It needs warm temperatures to grow, develop ears, pollinate the ears and to set the corn seeds after pollination. It is not a crop that transplants well so it's better to start the seed in the ground well after the last frost in spring. If you live in an area with late spring frosts and early fall frosts plant a variety that matures in less time. Corn matures from 75 days to 105 days. Corn requires a sunny location with eight hours of sun a day. Less than that and the corn will continue growing but it will slow down and may not reach its full height before it blooms. Add lots of organic matter and compost to the soil. Work it in well before planting. It's difficult to amend poor soil after the corn has been planted. Plant seedlings 3 inches apart and thin to a foot apart when the seedlings are 12 inches high. Rows should be 36 inches apart. The ears are produced on branches of the plant. If the plants are crowded, less ears will be produced. Plant in blocks rather than in long rows. If enough corn plants aren't close enough to each other the plants won't pollinate the ears properly and corn will not be produced. Unlike tomatoes or peppers, corn does not continue producing—one crop a season from each plant is all you get. 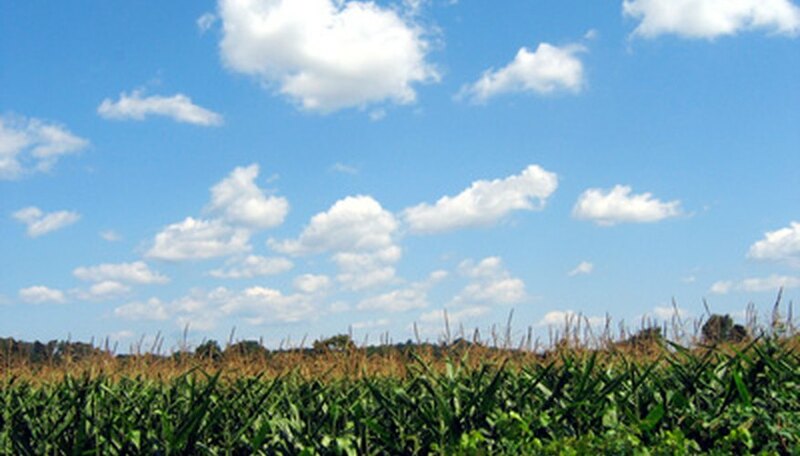 Days above 90 degrees and low humidity prevent the corn from pollinating. Corn has tassels at the top of the corn stalk which are the male flowers. The female flowers are the corn and corn silk. The tassels shed pollen that fall on the silk and a kernel of corn is born. Dry, hot weather dries out the corn before it reaches the silk and dries out the silk so the corn won't stick.